We have written directions from Atlanta, Chattanooga, Knoxville, and Asheville below. If you want to print, you can download these written directions as a PDF. We also have a detailed map of the Foundation in relation to the town of Robbinsville. Follow I-75 for approximately ten miles North of I-285 to I-575. (I-285 is the loop around Atlanta). Turn RIGHT onto I-575 (exit 268). In Marietta, I-75 branches off to Chattanooga, but you should stay on Interstate 575, turning into HIGHWAY 5/515, which is a four-lane. Take Highway 515/5 and follow this four-lane through Canton, Jasper, and Ellijay to Blue Ridge, Georgia. In Blue Ridge, watch carefully for SPUR 60, which is at the top of a hill past town at a light next to a Conoco gas station, and take a LEFT onto Spur 60. Go a short distance and watch for Spur 60(in Mineral Bluff) to turn RIGHT. Take this road which is a 13 mile, part 2-lane, part 4-lane road. Follow this until it intersects onto US 64/74 WEST of Murphy. Turn RIGHT on HIGHWAY 64/74 and follow the signs to Andrews (about 10 miles East of Murphy). (Highway 64 will turn right at the second traffic light in Murphy. Do NOT take this road. Stay on the same road that you are on, which turns into 19/74/129). When you get to Andrews, keep going on 19/74/129. This becomes a 2-lane road just outside Andrews, and follow it to Topton. You will pass the Topton Post Office on your left, and just past that, Highway 129 turns LEFT(over a bridge), at the top of the hill, and leads to Robbinsville. 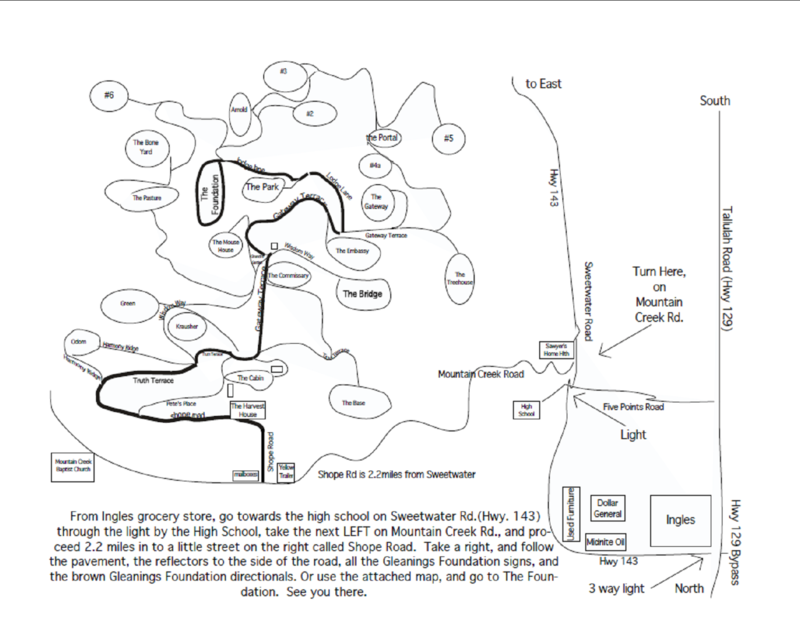 Follow Highway 129 into Robbinsville, and at the second light(Next to Ingles grocery store), take a RIGHT turn and follow Sweetwater(Hwy. 143) through another light by the High School, and the next left is Mountain Creek road. Take a LEFT on Mountain Creek Rd., and proceed 2.2 miles in to a little street on the right called Shope Road. Take a right, and follow the pavement, the white lines on the side of the road, all the Gleanings Foundation signs, and the brown Gleanings Foundation directionals. See you there. Exit I-75 North of Chattanooga going EAST on HIGHWAY 64(Exit 20). Follow Highway 64 past Cleveland, Tennessee, all the way to Murphy, North Carolina. Stay on the same road that you are on, which turns into HIGHWAY 19/74/129(a 4 lane road). This becomes a 2-lane road just outside Andrews, and follow it to Topton. You will pass the Topton Post Office on your left, and just past that, Highway 129 turns LEFT(over a bridge), at the top of the hill, and leads to Robbinsville. Follow Highway 129 into Robbinsville, and at the second light(Next to Ingles grocery store), take a RIGHT turn and follow Sweetwater(Hwy. 143) through another light by the High School, and the next left is Mountain Creek road. Take a LEFT on Mountain Creek Rd., and proceed 2.2 miles in to a little street on the right called Shope Road. Take a right, and follow the pavement, the white lines on the side of the road, all the Gleanings Foundation signs, and the brown Gleanings Foundation directionals. See you there. The shortest distance from Knoxville to Robbinsville is going to Maryville, Tennessee and then taking 129 SOUTH. From the airport, if you stay to the right, 129 will veer off to the right, saying Fontana/Atlanta South. Follow the 4 lane road past a big Shell station, and there will be a sharp left(90˚) where 129 with a small sign, separates from 411(at an old gas station on the left). This road is very curvy, and has an 11-mile section that contains 318 sharp curves, and is nicknamed “The Dragon”. This 2-lane is scenic, and quicker than other routes. After driving into Robbinsville, at the second light (near Ingles and Kerr Drugs), take a LEFT turn onto Sweetwater road(Hwy 143). Follow this road through another light by the High School, and the next left is Mountain Creek road. Take a LEFT on Mountain Creek Rd., and proceed 2.2 miles in to a little street on the right called Shope Road. Take a right, and follow the pavement, the white lines on the side of the road, all the Gleanings Foundation signs, and the brown Gleanings Foundation directionals. See you there. Follow I-40 WEST and take EXIT #27(The Great Smoky Mountain Expressway, 19/23/74 through Waynesville). Stay on HIGHWAY 74, on which you will pass Waynesville, Sylva, and Bryson City exits. Just past Bryson City, watch for HIGHWAY 28 going North(a RIGHT turn)(The road will be narrowing from a 4-lane down to a 2-lane after this turn). Follow HIGHWAY 28 NORTH (towards Robbinsville & Fontana). Approximately 10 miles later, you will turn LEFT onto HIGHWAY 143, which will bring you into Robbinsville. When you pass Hope for Families, and Smith’s Carpet stores on your left, the next right turn will be Mountain Creek road. Take a RIGHT on Mountain Creek road, and proceed 2.2 miles in to a little street on the right called Shope Road. Take a right, and follow the pavement, the white lines on the side of the road, all the Gleanings Foundation signs, and the brown Gleanings Foundation directionals. See you there.